The Great Lakes are a unique natural resource containing 20 percent of the world’s fresh surface water. These lakes form part of the international boundary between Canada and the United States. In order to protect water resources, address problems along their common border, and enhance water quality, the United States and Canada enacted the Boundary Waters Treaty of 1909 and subsequently established the International Joint Commission to implement the treaty. In 1988, the International Joint Commission identified forty-three specific locations in the Great Lakes where action was needed to control and cleanup pollution. The St. Clair River is one of these areas, known as an Area of Concern. The St. Clair River was listed as an Area of Concern because of significant historical pollution problems. Thirty years later, the St. Clair River still remains an Area of Concern. Degradation of benthos – pending removal! Restrictions on drinking water consumption, or taste and odor – pending removal! Tainting of fish and wildlife flavor – no longer impaired! Degradation of aesthetics – no longer impaired! Added costs to agriculture or industry – no longer impaired! Restriction on dredging activities – no longer impaired! 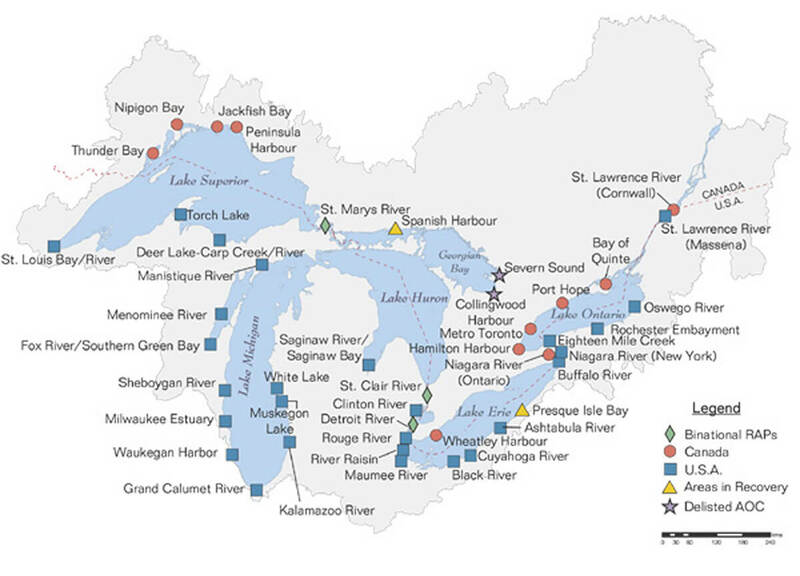 Each Great Lake and their rivers have fourteen protected Beneficial Uses by the U.S. and Canadian governments. The St. Clair River had ten impaired Beneficial Uses, but through almost three decades of collaborative efforts, conditions in the St. Clair River are improving. Today only six Beneficial Uses are impaired, with two anticipating removal in 2015. The goal is to have the St. Clair River delisted as an Area of Concern in 2019.